NASA'sPhoenix Mars Lander may have found water ice on the red planet, but it stillhas a lot of work left to do to answer the question that has been on scientists'minds for decades: Has Mars ever been capable of harboring life? Phoenix scientists announced yesterday thatthe mission finally confirmedthe presence of subsurface water ice in the north polar regions of Mars ?first detected by NASA's Mars Odyssey orbiter in 2002 ? about two months aftertouching down on the Martian surface on May 25. The landeris now analyzing the ice to see if it was ever a liquid and if it contains organicmaterials, the building blocks of life. The ice,collected from below the surface at the lander's site in the Martian arctic,could have actedlike a freezer, protecting any organics that may have formed there. "Wehave an environment where organics could be preserved," said missionscientist William Boynton of the University of Arizona. Thedetection of organics on Mars would not necessarily mean there is life. Itwould just mean that carbon and other molecules that make up life as we know itwere present. "Organicswould be the home run or the grand slam of the mission," said BruceJakosky, a geologist at the University of Colorado who is not affiliated withthe mission. However, if they don't find organics, "that doesn't mean thatthere wasn't life on Mars," Jakosky said. Other missions, planned andunplanned, will keep the search alive. Theconfirmation of the Odyssey ice observations was a key goal of the $420 million Phoenix mission, but only the first of several steps in characterizing thedirt and ice layer of Mars' Vastitas Borealis region to determine whether itmay once have been habitable at some point in the planet's past. 'I see thisas a step along the way of Phoenix getting to its major science results," Jakoskysaid. "By itself, that's not a major result." One ofthose steps is determining whether the water ice ever existed in a liquid form,said Phoenix robotic arm co-investigator Ray Arvidson of Washington Universityin St. Louis ? liquid water being a key resource for life as we know it. Phoenix willlook for signs of ancient liquid water by heating up samples of the icydirt mixture in the tiny ovens of its Thermal and Evolved-Gas Analyzer (TEGA),which can analyze the vapors given off by the heated samples to analyze theircomposition. TEGA hasalready begun heating up the sample that confirmed that the rock-hard layerbeneath the surface dirt was indeed water ice ? when ice begins to melt, ittakes more heat to raise the temperature of the sample. Over the course of thenext week, TEGA will gradually heat the sample all the way up to 1,832 degrees Fahrenheit(1,000 degrees Celsius). As thesample is heated, any hydrated minerals, or those that likely formed in thepresence of liquid water, show themselves as they break apart and the signatureof their water is detected by the instrument, explained Boynton, a TEGAco-investigator. Findinghydrated minerals, such as carbonates, sulfates or clays, would indicate thatliquid water once permeated the Martian regolith where Phoenix now sits,Arvidson said in a telephone interview last night. This waterwould not have flowed as rivers or streams, as it once likely did closer toMars' equator, where hydrated salts have already been found by NASA orbitersand rovers, but would have percolated through the dirt layer as Mars' orbitalmotions tipped the northern parts of the planet toward the sun, warming themup, Arvidson added. The otherbig signature Phoenix will look for as the mission continues and the probe'sovens heat up dirt samples will be organic molecules, the building blocks oflife. "Findingorganics would really change our way of thinking," Boynton said. But so far,organic molecules haven't shown up on Mars. When the Viking landers heated updirt samples in the 1970s, "there were really no organic molecules atall," Boynton said. But dirtnear the Martian equator faces strong oxidizing pressures, which can destroyorganics, Boynton added, which is why Phoenix is looking for them farther north. Organicshave proven elusive to Phoenixso far; the first dirt sample analyzed by TEGA, taken from the surface, foundno sign of them. But this wasn't much of a surprise to mission scientists. "Wedidn't really expect to find them in the surface soils," because thesurface is subjected to the same oxidizing pressure as the equatorial regions,Boynton told SPACE.com. TEGA willkeep looking for signs of organics in subsequent samples taken closer to theice layer, he added. If Phoenix doesn't find organics, the mission won't be a flop, Jakosky said, because it stillgives scientists valuable information about the northern region. "Whateverthey find is exciting," he said. If it doesdetect organics though, mission scientists will be cautious about interpretingthe findings, Boynton said. They would assume first that any organics could be contaminationbrought with the spacecraft from Earth. Mission scientists will check with a"blank" brought from Earth to determine whether or not any organicsdiscovered are terrestrial stowaways. Even if theblank shows that the organics came from the Martian soil, they still may not benative, Boynton said, since the same organic-bearing meteorites that strikeEarth strike Mars as well. Determining the ultimate origin of any organicswould likely take bringing back a sample to Earth, a project that both NASA andthe European Space Agency are working toward. Andorganics don't on their own equal life. "Just because there are organiccompounds, doesn't mean that that's life," said Kim Seelos, a postdoctoralresearcher at Johns Hopkins University. 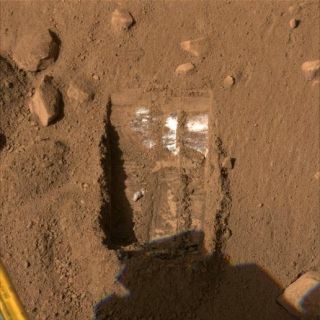 Whether ornot Phoenix finds signs of organics, it won't be the last time that NASA looksfor them on Mars. NASA's MarsScience Laboratory (MSL), set to launch in 2009, will pick up where the1970s Viking missions left off, exploring the regions closer to the equator forsigns of them. MSL will bebetter equipped than Viking, and even Phoenix, to detect organics in dirtsamples, with more powerful and sensitive equipment, as well as the ability toroam around. While"life is teeming on Earth," Arvidson said, it may not have been sodense on Mars ? if it ever existed ? perhaps only forming in small pockets.Since Phoenix, as a lander, stays put by definition, it can only explore thepatch of ground in its immediate vicinity. However,any organics detected by MSL would have formed in a much more ancient period ofMars' history because the landscape near Mars' equator formed billions of yearsago. The surface that Phoenix is exploring is much younger, only tens of millionsof years old. For now, Phoenix is the only chance of finding organics on this region of Mars, since no futuremissions in the works now are planned to return to the frozen northern reaches.To get another mission back there to look the region in greater detail,"it would probably take finding organics," Boynton said. But "Phoenix isn't the last gasp, or MSL isn't the last gasp" to answering the question ofwhether life ever existed on Mars, Jakosky said. Theevidence available to scientists now suggests that Mars could have harboredlife, it's just a matter of finding a spot that preserves the signs of it, headded. And Phoenix's landing site, or even MSL's, may not be the ideal spot togo and look for those signs, whether by sending another rover or staging amission to return a sample to Earth. There areplenty of other environments on Mars where Jakosky would like to look for signsof life. While he can't point to a particular spot, there is evidence that Marsonce had features that could have supported life, including ancient lake beds,ancient highlands where evidence suggests that water existed for long periodsof time, and hot springs ? "places like Yellowstone," as Jakoskydescribes them. Somescientists, such as Seelos, doubt that clear evidence of Martian life itselfwill ever be found because any life would have likely been microbial, which isnot easily preserved as fossils. But Jakosky sees this as an"unnecessarily pessimistic" view, because ancient microbes have beenpreserved in some places on Earth. But itcould be awhile before scientists ever answer the question of life on Earthbecause they currently understand so little about the history and geology ofMars, Jakosky said. "Wedon?t know the answer and I don?t even know how to put odds on "when andwhether they will find the answer," Jakosky said. His adviceis to keep using missions like Phoenix, MSL, and eventually a sample returnmission to build our knowledge of Mars, as we have built the knowledge of ourown planet's past.